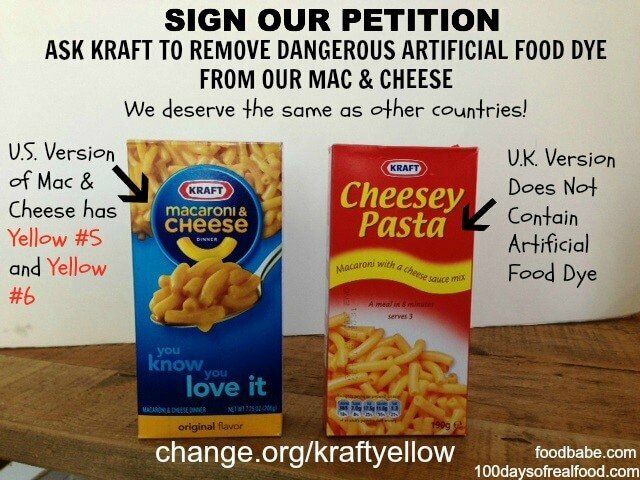 In a mere 36 hours our petition asking Kraft to remove artificial food dyes from their line of macaroni and cheese products has gone viral and now has more than 170,000 signatures. We are so taken aback by the instant and widespread media attention on this topic, which we think indicates how this much-needed change in our Food Industry has been imminent for some time. One of the big guys just needed a little push in the right direction, and we hope this is it. (Be sure to sign the petition if you haven’t already!). We want to take a moment to share that this petition is honestly much bigger than just macaroni and cheese or even Kraft. There are many large US companies that use artificial dyes – as well as other additives – in their food products here that are not used overseas. Everyone from General Mills to Kellogg’s to Pepsi, and of course Kraft, have formulated safer, better versions of their products for other countries and this petition is a vehicle to let these companies know it’s time for American consumers to get the same. 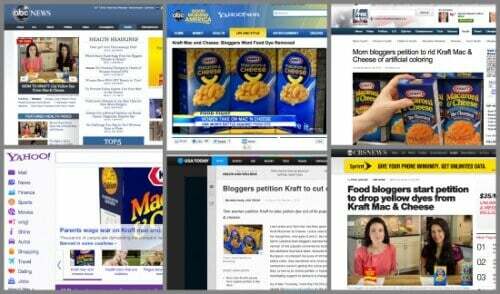 Our petition in particular is focusing on an iconic food product like Kraft Macaroni and Cheese because we thought this would be the best place to start to generate public awareness. If Kraft, the largest US-based food company, takes the lead by voluntarily removing potentially harmful – yet unnecessary – artificial food dyes our hope is that the others will follow suit. Whether or not you buy or eat this product think of those who do (the average consumer assumes products on grocery store shelves are completely safe and seldom reads ingredient labels). The UK version, which we made and sampled ourselves, is dyed with natural colors (paprika and beta carotene) and looks and tastes almost exactly the same. This is not about taking away anyone’s beloved mac and cheese. Artificial food dyes are derived from petroleum, they either require a warning label or have been phased out in other developed countries due to health concerns, and they add NO value to the foods they are in whatsoever. These dyes are purely for aesthetic reasons only. Check out my post sharing the 7 reasons I hate artificial dyes for more information. FYI – Just for the record we don’t buy it and happen to care about more than just ourselves. How is removing a harmful ingredient “messing things up for the rest of us”? Kraft has successfully reformulated this product in other countries without sacrificing taste. Kraft has responded to our petition stating that “The safety and quality of our products is our highest priority and we take consumer concerns very seriously.” They also shared that they have just over a dozen versions of macaroni and cheese in the US that do not contain artificial dyes. Vani and I are still concerned though about the 30 or so that do contain these dyes, over half of which are targeted at children. So we will continue to fight this fight and in case you’ve missed some of the national coverage here is a little summary of the news clips! Thank you, thank you..for posting this..Dr.Oz is my favorite..will watch this tonight..I taped it..thank you for sharing all the Kraft info with us. I don’t by prepackaged foods any longer, but I will inform my son that this product is toxic!!! This is what he feeds my grand children..
your a blessing to us all..
Just saw clips from your Dr. Oz appearance. Awesome job! Way to go. I am so sad that I have given this stuff to my children without the knowledge of what was in it and what it was made from. Thank you so much for checking into this and giving out this informations. I am so glad I watch Dr. Oz everyday. I can not thank you enough. I cannot thank you enough for doing this. My son is 3 years old and has adverse reactions to food dyes. I just watched the Dr. Oz clip and I applaud you. Something has to be done about this. I am not able to sign your petition. When I go to the site that is linked the box to sign up flashes on my screen for a few seconds then disappears. I have tried multiple times so sign. I will attempt to sign it from a different computer tomorrow. Since Kraft hasn’t replied, you need to go to their largest customer with your concerns: Wal Mart. Ask Wal Mart to take it off the shelf. Wal Mart represents so much about food for the masses, and the Wal Mart consumer is also a core user base of Kraft Mac n Cheese. Wal Mart will care. I appreciate the suggestion, but the reality is that Wal-Mart (nor any other grocery store) will want to fight this fight because 80% of the foods on their shelves likely contain artificial dyes. I really couldn’t care less what the put in their product, as long as it is accurately listed on the box. I don’t eat it, but I don’t eat many products for the same reason I wonder why this mac and cheese has been singled out. Kraft and Walmart don’t exist to take care of our health, they exist to make money. That’s what businesses do. Unfortunately I read this post after purchasing pre-natal vitamins. In my PRE NATAL vitamins, I found in the ingredient list both red dye # 40 and yellow dye # 6. Obviously there is no cosmetic benefit for dying a vitamin and I am very disturbed that these ingredients would be included in something doctors recommend women take before, during, and even after pregnancy! When I was pregnant with my second child I started to have constant migraines. I was told that after I had my baby they should stop. Well my baby turned 1 and I was still having constant migraines. Also my baby girl that was now eating real food, was constantly covered with hives from head to tow and the doctors had no answers for me. I could no longer live with the constant pain and I was tired of taking medication. So I started to do some of my own research I found that allergies could cause migraines (My doctors had never mentioned that). I did not regularly eat most of the things that caused migraines except for food dye. So I decided to try going with out it for a month. By the end of the first week having no food dye in my home my migraines were gone. Even better my baby no longer had rashes. My older child’s behavior had improved tons. I had always had a hard time learning and all of the sudden I could understand what I was reading. Going from a dyslexic mess to reading and enjoying it has been amazing for me. I curse the government for allowing such filth in are food. towards my previous post and the people who commented- I am not “justifying it” Im just saying you’re wasting your time fighting one company. And i DO agree with the person who said we must take it one step at a time and Im not saying they should truly fight it Im saying they should do one of these ridiculous posting links towards the FDA or they should go start a walk or something.